What do two-by-fours and iPhones have in common? They’ve both been sold on the stretch of roadway seen here. Now home to upscale Old Town retailers like the Apple Store, Pasadena’s Colorado Boulevard had a decidedly more rustic feel when the above photograph, courtesy of the California Historical Society Collection at the USC Libraries, was taken around 1880. 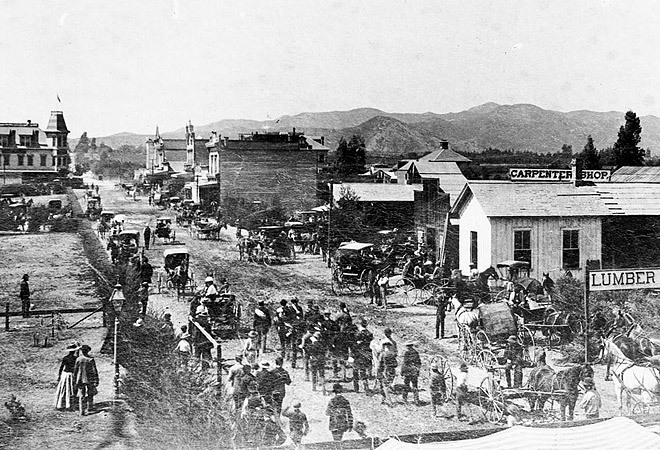 Ever since merchant L. D. Hollingsworth opened a general store and post office at the road’s intersection with Fair Oaks Avenue in 1876, Colorado Street (as it was originally named) has been Pasadena’s main commercial corridor. The three-story Ward Block, visible on the photograph’s left side, was among its first landmarks. In its early years, Colorado lost itself in the orange groves east and west of the town’s center. Eventually it extended east to connect with Monrovia and west across the Arroyo Seco over a soaring, arched bridge that became notorious for suicides. The street also gained notoriety for its traffic congestion, an inevitable result in a booming city where automobiles, trolleys, pedestrians, and bicyclists shared a main street only 72 feet wide. After decades of false starts, Pasadena finally widened the street to 100 feet between 1929 and 1930, a process that cost nearly $3 million and forced property owners to slice 14 feet off the fronts of their buildings. Many structures lost their original Victorian facades and instead acquired an Art Deco or Spanish Colonial Revival character. The road first found nationwide fame as the Tournament of Roses Parade route and between 1926 and 1940 it was signed as U.S. Highway 66. In 1958, Pasadena redesignated it as a boulevard, signaling that Colorado—once home to lumber yards and carpenter shops—had come of age.